other Caribbean conservation programs, and other marine topics. Centro Ecológico Akumal and the tourists who come to visit Akumal in order to remain healthy. Although coral appears to be dead rock it is very much alive and, as all life, it is fragile but also very resilient. As long as people behave properly while visiting the reef it will be able to live strong and healthy. On this site you will find information about the Mesoamerican Reef System and tips on behavior to help make sure the reef is alive and growing. Final throes for Jamaica's 'Hippie Paradise'? A new report spearheaded by the CARIBSAVE project under UNDP funding highlights the impacts of climate change on Caribbean nations and natural resources. In particular, the report highlights the difference in the impacts at the 2.0°C increase being pushed by many UN negotiators vs. the 1.5°C increase promoted by the Alliance of Small Island States. The report focuses on: the implications of ice sheet melt for global sea level rise (SLR); the projections and implications of SLR for the Caribbean region; evaluation of the differential impacts of +1.5° and +2°C on coral reefs, water resources and agriculture in the Caribbean, with additional analysis for the Pacific islands. Of particular interest are the sections on climate change and ocean acidification impacts on Caribbean coral reefs -- analysis led by NOAA's Coral Reef Watch and its partners. For centuries, Negril, a seven-mile stretch of white sand beach on the western tip of Jamaica, was cut off from the rest of the island by bad roads and a large swamp. It remained relatively unknown to the world until the 1960s and 1970s, when U.S. "hippies," students and Vietnam veterans gravitated towards this laid-back village. The U.S. travellers arrived in ever-increasing numbers and, towards the end of the 1970s, Negril blossomed as a tourist destination. But with the growing population and improved infrastructure, the natural beauty of Jamaica's third largest tourism centre has suffered visible deterioration. "When I first visited Negril from Kingston in 1960, just after the first road to the coast was built, there were no buildings the entire length of the beach. The waters were crystal clear," wrote Thomas J. Goreau, president of the non-governmental U.S.-based Global Coral Reef Alliance, in a paper published in 1992. "Now that it is Jamaica's fastest growing resort area, all the tall coconut trees are gone, the beaches are crowded with people and buildings," states the text. Eighteen years later, the demise of the Negril environment has again been brought into sharp focus, this time by United Nations Environment Programme (UNEP) Division of Early Warning and Assessment. Expert Pascal Peduzzi, who heads the Early Warning Unit, predicted in March that several beaches on the western end of Jamaica could be totally wiped out in the next five to 10 years if local authorities and residents do not act now. His prediction is based on data coming out of a UNEP study on the role of the ecosystem in disaster risk reduction. "The data has found that beaches in Negril are receding between half and one metre per year," said Peduzzi. The scientific evidence shows that over the past 40 years Negril's beaches have undergone severe and irreversible shoreline erosion and retreat, according to the study entitled "Risk and Vulnerability Assessment Methodology Development Project (RiVAMP): The Case of Jamaica." "The highest erosion rates have occurred after 1991, when beach recovery after storms has been slower, and these trends are likely to continue," Peduzzi said. The UNEP report says bad environmental and building practices and illegal dumping of pollutants in the sea were killing sea grass and coral reefs, thus reducing their effectiveness in protecting the beaches from erosion. . . . The National Park located on the West Coast of Isla Mujeres, Punta Cancun and Punta Nizuc, which welcomes approximately 750,000 annual tourists, will feature more than 400 concrete sculptures making it the world's largest underwater museum, located in the waters facing Cancun and Isla Mujeres. At a cost of more than $350,000 dollars, the project has been put into place to help conserve natural reefs and give them the opportunity to flourish. The Marine National Park has stepped up to the challenge of diverting tourists away from natural habitats along the natural coral reef units, without losing their visitors and the $36 million dollars they bring into the area each year. Since November 14th of last year, Phase 1 of the project included the sinking of three sculptures under the supervision of prominent artist and underwater sculptor Jason de Caires Taylor, including sculptures such as "Dream Collector," "Man on Fire" and "The Gardener of Hope." The second phase of this magnificent project is well underway, with the hopes that it will eventually become the largest underwater museum in the world with more than 400 sculptures placed on the sand, as well as sunk to a variety of different depths, throughout the national park. These sculptures will be placed near natural reefs and marine life in order to create an artificial habitat. Once this stage is completed, additional artists will be invited to display their sculptures and contribute to the museum. Each individual work of art will be life-sized and will be mounted on a base of four square meters and will consist of themed galleries such as "The Quiet Evolution." The museum seeks to promote, among other things, the philosophy of conservation, as is the "Dream Collector" sculpture, which contains bottles with messages of good hope sent from around the world. One of the first messages in a bottle attached to the above mentioned sculpture reads: "May our hearts, never become as hard as our heads," by Roberto Diaz, President of the Cancun Underwater Museum. . . .
Just like you, conservationists, fishermen, chefs and consumers are working together to find new ways of living off our oceans and waters while keeping nature healthy. Love to cook? Find out why ocean conservation is important to world-renowned chefs Mario Batali and Dan Barber, and recreate their recipes for Mackerel in Scapece with Lemon Thyme and Sweet Peppers and Escabeche of Spanish Mackerel. While you’re cooking, share your favorite seafood recipe. And while you’re out, keep a copy of this pocket seafood guide by the Monterey Bay Aquarium in your wallet, or text Blue Ocean’s FishPhone to help you choose sustainable seafood at the grocery store or in a restaurant. Dead turtle ensnared in fishing net floating in sea. WASHINGTON – The State Department says Mexico is losing its certification to export wild-harvest shrimp to the United States because its trawls lack required protections for endangered sea turtles. The department says the certification was withdrawn after the U.S. National Marine Fisheries Service determined that Mexico's turtle excluder devices no longer meet U.S. standards. U.S. rules require that exporters use excluders comparable to those used by American shrimpers. Certification for Mexican shrimpers will be withdrawn on April 20. The Endangered Species Act lists six of the seven sea turtle species as endangered or threatened. 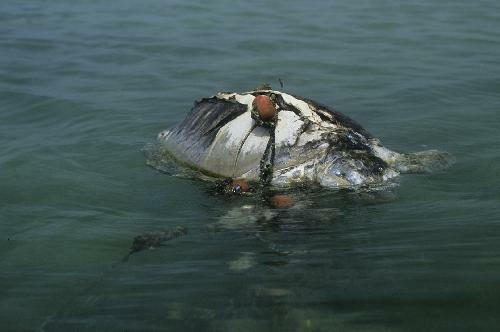 The State Department said proper exclusion devices can prevent turtle mortality in shrimp trawl nets up to 97 percent. MARSH HARBOUR. Bahamas -- The explosion of lionfish population in Bahamian waters is “a plague of biblical proportions stalking the Bahamian economy,” the Reef Conservancy Society of Abaco is warning. They are convinced that unless urgent action is taken it will wreck tourism, fishing and related industries. It has now been confirmed that lionfish, known for their voracious appetite for Bahamian marine life, have been decimating fish that tend the coral reefs. The loss of herbivorous fish sets the stage for seaweeds to potentially overwhelm coral reefs and disrupt the delicate ecological balance in which they exist, studies show. Following on the heals of over fishing, sediment depositions, coral bleaching, and increasing ocean acidity, “this is of grave concern,” said renown zoologist/marine biologist, Dr Mark Hixon, a professor at Oregon State University. Dr Hixon and his group work from the Perry Institute for Marine Science, Lee Stocking Island, Exuma. They have a three-year grant from the US National Science Foundation to study lionfish. He warned that the rapid reproduction potential of lionfish must now be understood in context with their ability to seriously depopulate coral reef ecosystems of other fish. It is well documented that over fishing parrotfishes and other herbivores contributes to the death of reef-building corals. Lionfish are “highly effective” at ‘over-fishing’, he warned. CEA is an organization that depends heavily on volunteers. If you have the willingness to have fun while you help to preserve the environment, come and be part of CEA! You can participate in different programs. Our next Reef Monitoring phase begins this March 28, while our Sea Turtle Program will start May 10. Other programs are already running, but you may still apply. Don’t forget to send your application forms now! For further information visit our Web site or send an e-mail to info@ceakumal.org. Check back for updates on events. Want to post?Ed Blume, a volunteer for Centro Ecológico Akumal (CEA), moderates the blog. Anyone wishing to post can contact Ed at ed@ceakumal.org.